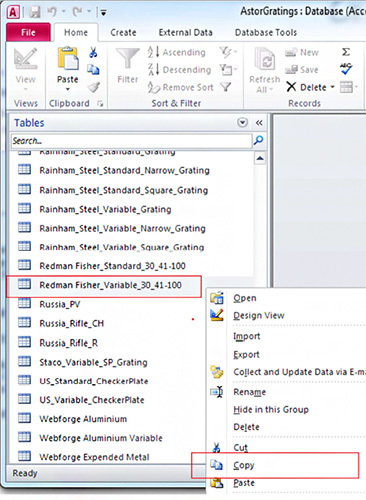 How to create a new Grating Class in Autodesk® Advance Steel 2015? 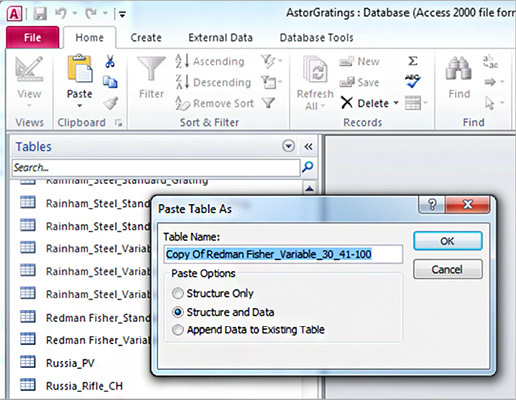 This procedure explains how to create a new "Grating Class" in Advance Steel 2015. This process will also work for earlier versions of Graitec Advance Steel from AS2012 on. 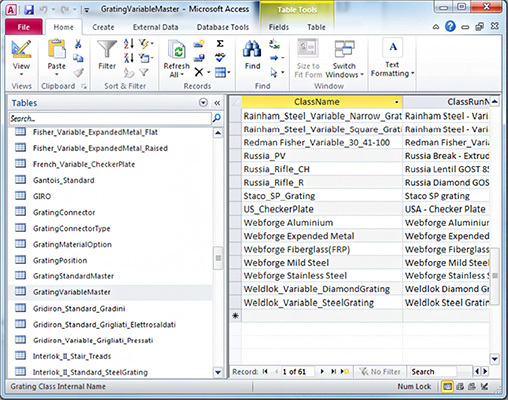 This process differs from earlier versions of Advance Steel as the grating class cannot be added using the "Table Editor" in the "Advance Management Tools". It is necessary to access the main database (mdb) files using Microsoft® Access or a similar database editing software. By far the easiest way to create a new Gratings Class is to copy an existing Gratings Class. Consider if you want to create a "Standard Grating" (fixed grating size – 6.0m x 1.0m etc.) or a "Variable Grating" (the user sets the grating size in the model). For this FAQ we will assume a "Variable Grating". Select an existing grating type that closely matches your requirement (less editing later). Right click on the grating name and select "COPY" (Fig 1.) – Redman Fisher_Variable_30_41_100 in this example. Figure 1 - Select an existing grating type. Right click on the grating name and select "COPY"
Right click again and select "Paste". 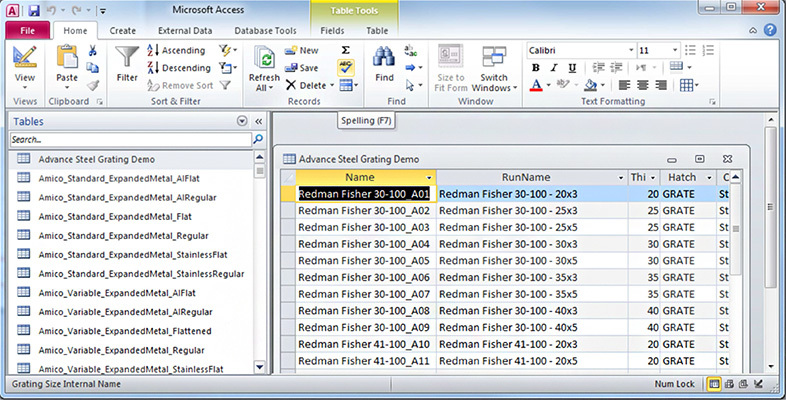 In the "Paste Table As" dialogue, name your new table and select "Structure and Data". Click "OK" to confirm. Look for the table in the list of databases and open it by double clicking on the name. The information for the copied grating is in the table you have created so you can erase all the rows except the first one, which we will keep for reference. Add data to this table to match the standards from your supplier"s catalogue. ⇒ The first column, "Name", is the internal name of the grating and should be entered without spaces and should contain the description of the grating. This entry must be unique so in our example above you can see that the entry is appended by "A01", "A02" etc. The name of the grating should be taken from the supplier's catalogue. ⇒ The second column, "RunName", contains the name you will see in Advance Steel 2015 and in the drawings and in generated reports (BOM etc.) This name can have spaces. ⇒ Note - For Standard Grating only the column "Length" is the length of the grating as supplied and you can find this in the supplier"s catalogue. This dimension should be in millimetres. ⇒ Note - For Standard Grating only the column "Width" is the width of the grating as supplied and you can find this in the supplier"s catalogue. This dimension should be in millimetres. ⇒ The third column in our example is "Thickness". This is the thickness of the grating and you can find this in the supplier"s catalogue. This dimension should be in millimetres. ⇒ The forth column is "Hatch". This is the column where you can choose what type of hatch is shown in the model and in the drawings when the display type is set to "Exact with hatch". These names are the names from AutoCAD® or you can create your own hatches using the AutoCAD® tools. ⇒ The fifth column is "ConnectorName". This is where you can enter the name of the connectors for each type of grating or you can leave it as "Standard connector". ⇒ The sixth column is "ConnectorQuantity". In this column you need to enter a number for how many connectors you need for each grating. The default is four. ⇒ The seventh column is "Material". This column should be completed with the grating's material (S275JR for example). The material should exist in the "AstorBase.mdb"
⇒ The eighth column is "Coating". This column should be completed with the grating's coating (Galvanised for example). This coating should exist in the "AstorBase.mdb"
⇒ The ninth column is "Weight". In this column you need to put the grating's weight and this can usually be found in the supplier"s catalogue. The information is in Kg/m2 (kg/square meter). ⇒ If there is a column "System" you can enter 0. ⇒ The last column is "OwnerText" which should be your author, and can be different than "DCS" ("My Company" for example). After you create all the combinations you need, you can erase the first line, which was for reference only, and you can close the table. To be able to work with the new grating we need to modify the "Master" grating table. There are two tables ending "Master". The first one, "GratingStandardMaster", is for all the gratings that are a standard size as supplied (6.0m a 1.0m for example) and "GratingVariableMaster" for the variable gratings where the size is determined within the Advance Steel 2015 model. In our example for "Variable Grating" we will add a new entry to the "GratingVariableMaster" database. Open "GratingVariableMaster" by double clicking on the name. In the database you will add each new entry where indicated by the symbol (Fig 4) – the last row in the database. ⇒ The first column is "ClassName". It is the internal name of the grating and should be entered without spaces and should contain the description of the grating (e.g. "Lionweld_Kennedy_Flowforge_Grating"). ⇒ The second column, "ClassRunName", contains the name you will see in Advance Steel 2015 when you create the grating. This name can be the same as the "ClassName".You are allowed spaces in this field (e.g. "Lionweld Kennedy Flowforge Grating"). ⇒ The third column is the "TableName". This name must be the same name as the table we created earlier. You can copy and paste the name from the table you created. The name is case sensitive and if it is not identical to the name of the new table the grating will not work. ⇒ The forth column is "Order by" and this determines the order of the entries in the database – "Name" is usual for most gratings. You have now finished editing the AstorGratings database so the database can be saved and closed. Exit from Microsoft® Access (or your database editing software). In order for the changes to take effect, either close down and re-start Advance Steel 2015 or if Advance Steel 2015 is already open "Update defaults" using the icon on the Home > Settings ribbon menu.